Honey is not only good for us in many ways; it has some unique properties that make it pretty amazing. Honey can be used as a natural sweetener, energy booster, cough suppressant, and skin healer. Honey is made by busy bees. It takes about 60,000 bees and more than two million flowers to gather enough nectar to make just one pound of honey. There are over 300 unique varieties of honey in the United States. Honey can vary in color and flavor depending on the source of the nectar (type of blossom – like Clover, Eucalyptus and Orange Blossoms). In general, lighter colored honeys are mild in flavor, while darker honeys have a stronger flavor. The most natural form of honey is raw honey, where beekeepers just filter out large particles, and can be purchased through local beekeepers. Honey contains trace amounts of bee pollen which can help reduce seasonal allergy symptoms. By consuming the bee pollen, you are helping to inoculate yourself against local allergens. The National Honey Board by USDA has a honey locator website you can use to find local honey. You can also contact your local beekeepers associations. Honey that you buy in the store has been pasteurized to prevent granulation. Honey is nature’s sweetener. Honey is easier for the body to digest than sugar and is slightly sweeter than sugar, so you can use less. 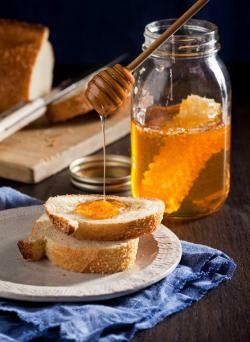 Honey adds a unique flavor to any dish and balances and enhances the flavor profiles of other ingredients used in a recipe. It can serve as a binder and thickener for sauces, dressings, marinades and dips. Honey provides and retains moisture to a variety of dishes and can even extend the shelf life of baked goods. To substitute honey for granulated sugar, begin by substituting honey for up to half the sugar in the recipe. For baked goods, reduce the oven temperature by 25ºF to prevent overbrowning; reduce any liquid by ¼ cup for each cup honey used; and add ½ teaspoon baking soda for each cup of honey used. Measure honey easily by coating cup or spoons with oil or non-stick spray. Decrease the amount of liquids by 1/4 cup per cup of honey used. If honey crystallizes, remove lid and place jar in warm water until crystals dissolve, or microwave honey on HIGH for 2 to 3 minutes or until crystals dissolve, stirring every 30 seconds. Do not scorch. Honey is a great energy booster. Honey has 17 grams of carbohydrate per tablespoon. The body uses carbohydrates for energy and to help maintain muscle glycogen, also known as stored carbohydrates. Honey is a quick, easy and tasty natural energy source. Honey can be used as a natural cough suppressant. It coats and soothes a sore throat. You can also add honey to tea or try mixing it with orange juice. One study by Penn State University found that buckwheat honey was more effective in suppressing coughs in children than over the counter cough medicines that contain dextromethorphan. Note that honey should NOT be fed to infants less than 1 year of age, but is safe for older children and adults. Baby’s intestines are not mature enough to handle any potential botulism spores that might be picked up by the bees and transferred to the honey. Honey has been used for centuries for skin care and healing wounds. This amazing natural chemical reaction takes place in the making of honey that forms hydrogen peroxide, giving honey anti-microbial properties. Other factors that make honey a healing agent are high sugar/low water content, low protein, high acidity, presence of antioxidants. Honey is a humectant, attracting and retaining moisture, which makes it a prime ingredient for moisturizers as well as shampoos and conditioners. Honey has many benefits and uses. Try some today!